I started working with Isabella, one of my younger clients, in January. She was close to turning two, and her mother was getting worried – her baby girl wasn’t walking yet. But we knew that, with physical therapy, Isabella could learn and do amazing things. 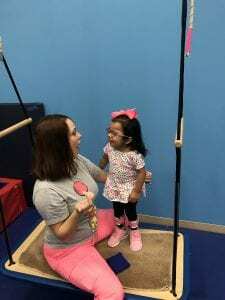 It was a magical moment when Isabella took her first steps – the kind of moment every therapist hopes to have. But we couldn’t stop there. Our next goal was for Isabella to be able to stand up by herself. Isabella’s second birthday came and went. We continued to work twice a week to help further Isabella’s success by enabling her to stand independently. Then one day, it finally happened. Her base was wide and her transition was slow and shaky, but Isabella stood up all by herself! We’re still working on Isabella’s development. She still has more milestones to meet. But I will always be impressed by how far Isabella came in just a matter of months.